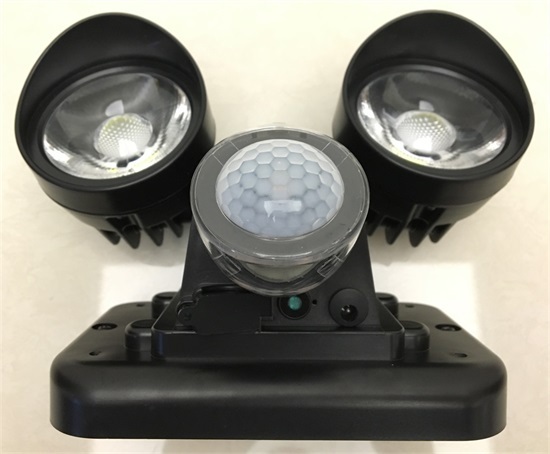 Stop unwanted guests in their tracks with the intelligent VSDFL720P Dual Head Lamp LED PIR Sensor Light. This light features independently adjustable twin, extra bright LED lights to shed light on approaching visitors. The passive infrared (PIR) motion sensor can be adjusted so it picks up movement only from a specific area, and the lights can be pointed to the same or a different spot. There are adjustments for the range of the PIR and the time the floodlight remains on. The video camera points the same direction as the PIR. Built-in to the side of the camera is an SD memory card slot (Micro SD card not included) to allow for local recording. You can remote playback recorded video file or watch realtime video via your iOS & Android Device, or Remove the memory card to re-watch and analyze footage on your laptop or DVR system for use as evidence or to just see what's happening on your property at night. * Wifi camera: View Video from any where from your cellphone, laptop, computer,pad. * LED light, Wifi Camera, DVR, all in one unit. 2. Auto Lighting and motion detection when motion trigger happen. 4. Digital Image & Video Capture via cellphone. *Support PAL/NTSC, max 32Gb TF card. *Either 1 or 2 photo capture or 10 sec AVI video capture.